Where is the water in my crawl space coming from? 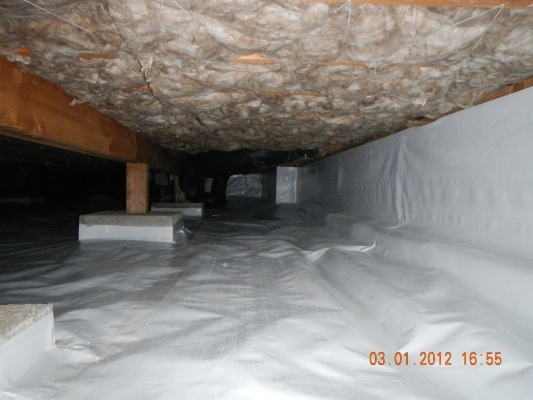 So you have a water problem in your crawl space. You need a sump pump, right? Maybe…., but maybe not. Before you decide to have a sump pump installed in your crawl space a little investigation is warranted. Is the water coming into the crawl from an underground spring or from an outside source? We’ll help you determine this. Keeping the water out of the crawl in the first place makes sense, not to mention saving your foundation from costly repairs down the road. The water problem could be from your downspouts. Downspouts can deliver up to six times more water than a garden hose and can wreak havoc on your crawl space and your foundation. The down spouts need to be connected to a drain that directs the water away from the home or the ground surrounding needs to have a 2% grade away from the home for about 4 feet or the downspouts need at least 4 feet of extensions away from the home. In any case, directing the water away from the home is the best option.